Home » WOD Blog » Everything is everything is everything…. Everything is everything is everything…. EXTRA! : If there are more people in class than squat racks, we will have to heat this. If there are more than twice as many people as squat racks (which is very unlikely, but possible), then we will change the strength portion to a more traditional setup of 2 reps EMOTM for 10 minutes. As a coach, the ability to continually learn, adapt, experiment, communicate and ultimately affect change is what separates the good ones from the bad. This is what we believe and what drives us to do what we do everyday. This past weekend we took the opportunity and attended the outlaw training camp to gain a little more insight into the program while rubbing elbows with the “bearded wizard” himself. There were a few PR’s along the way and we got to witness world class athletes do what they do so beautifully well. While the “take-away” sometimes takes a few days to marinate in my mind, I can share the three beliefs that help define the Outlaw way. Everything is Everything. This is something we actually articulate all the time and it’s nothing more than making connections between the “what” and “how” we train in the gym to the “why” of it all. The efficacy of the program is summed up with this top-down idea and we see it over and over in the programming. The Olympic lifts represent the pinnacle of expressing the 10 physical skills and the better you are at these, the better you are at crossfit. You can see the carryover and the connection all the time. 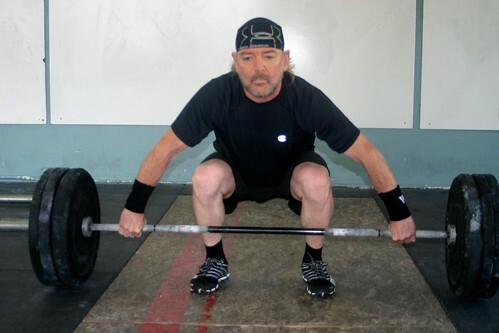 We know the high bar back squat and front squat carryover to the receiving position of a clean, which carries over to the thruster which looks a lot like a wall ball, etc. Is it also any wonder the person who can walk on their hands all day can get a large load overhead? Everything is everything. Get. Stronger. Now. Year after year, workouts and competitions have gotten heavier and heavier. Clearly the sport is becoming more strength biased, but the desire and need for such strength isn’t limited to the elite athlete. Being able to express strength means you are maximizing the contractile potential in your body and that has enormous carryover in crossfit, sport and life . We do this by lifting heavy, lifting dynamically, and lifting often. Keep in mind, strength training is more about central nervous system stimuli than it is about developing muscle size. More knowledge bombs to be dropped during the week. To be continued…..